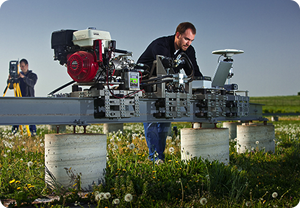 Agricultural Engineering is a field of engineering that deals with the conceptual study of Agriculture and irrigation techniques to plan, monitor and coordinate R&D programs. It incorporates technology practices and various disciplines of science for the purpose of efficient processing and production of food, fibre, feed and fuels. Agriculture engineering helps us to redirect our lives on the path of easy and effective agriculture practices by using the technical and highly precise equipment that are used for agriculture purposes. Agricultural Engineering is originated from the core streams like mechanical engineering (automated machine systems and agricultural machinery), soil science (fertilization, crop nutrient, etc. ), plant biology (seeding and plant growth management), environmental sciences (irrigation and drainage), animal science (housing and animals husbandry) etc. In practice to increase the productivity and efficiency of agricultural land, we require to produce the instruments and equipments that are most suited with the different needs and requirements under different climatic and physical conditions. Agricultural engineers perform tasks such as planning and supervising the technical, climatic and atmospheric conditions for gaining the desired resultant for managing flood water control systems, building of dairy effluent schemes, drainage, performing environmental impact assessments, irrigation, agricultural product processing, implement relevant practices and interpret research results. The basic pay that is provided to an Agriculture Engineer after the successful completion of Bachelor degree in Agriculture and Irrigation is 2.5~3.5 Lakh INR annually. The pay scale for an agriculture engineers increases twice or thrice the current figure after achieving a necessary experience and technical skills in the relevant field. The dream behind the development and enhancement in agriculture engineering practices is to produce the climatic and region based engineering technologies to enhance the productivity and the profitability that can be achieved from different farming systems. After the completion of engineering in agriculture and Irrigation, the candidates may choose their job field in production, management, sales, applied science, research and development for building up effective, precise and most accurate agricultural machinery, processes technology, equipment, and structures for storing crops and housing livestock. For any type of queries and assistance, while choosing the Agriculture Engineering as your Career Stream, you can contact us by using the feedback section or the comment box. We are always here to assist you with the most optimal solutions to your issues in the direction to make you stand on a comfortable and happier side.